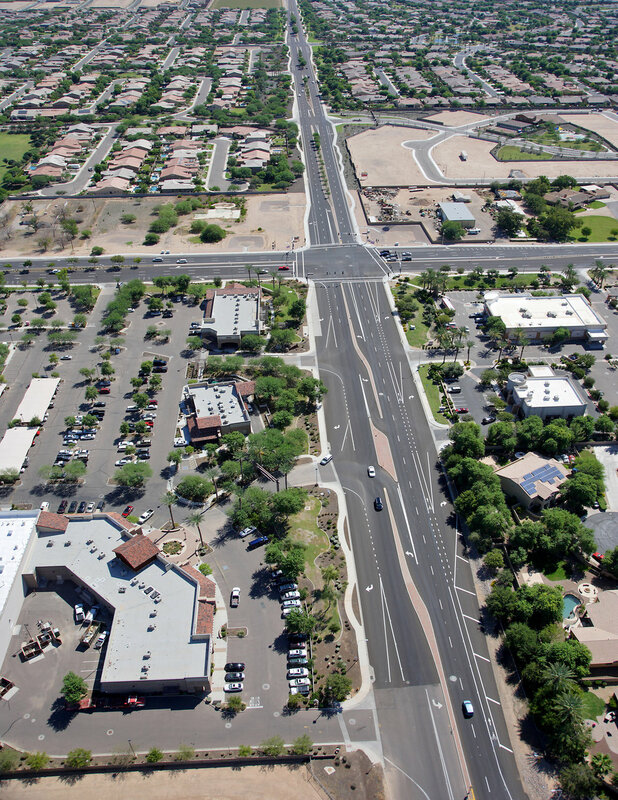 This multi-phase, CMAR project for the City of Chandler began with Gilbert Road Improvements - Germann Road to Queen Creek Road in 2008. 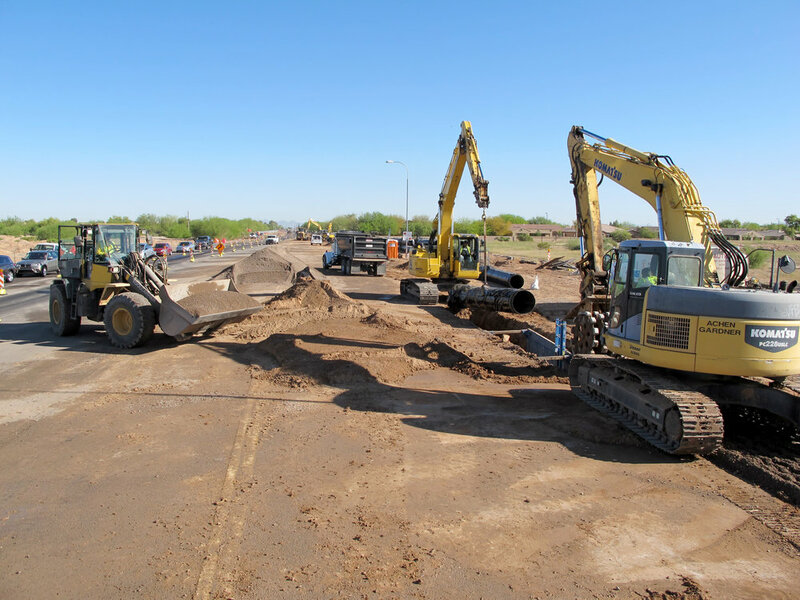 The widening and improvements project included 4.5 miles of roadway and more than 63,000 LF of regional wet utility upgrades (including storm drain, water, reclaimed water, sanitary sewer, SRP Irrigation, and RWCD Irrigation). Work also included expansion of 4 intersections and OH to UG conversion of SRP distribution and transmission. GMP 1 / Germann Road to Queen Creek Road: The project consisted of roadway improvements to Gilbert Road (Germann Road to Queen Creek Road), including widening the road to six through lanes with right and left turn lanes, new curb and gutter, sidewalks, bike lanes, landscaped medians, traffic signals and all other required infrastructure. 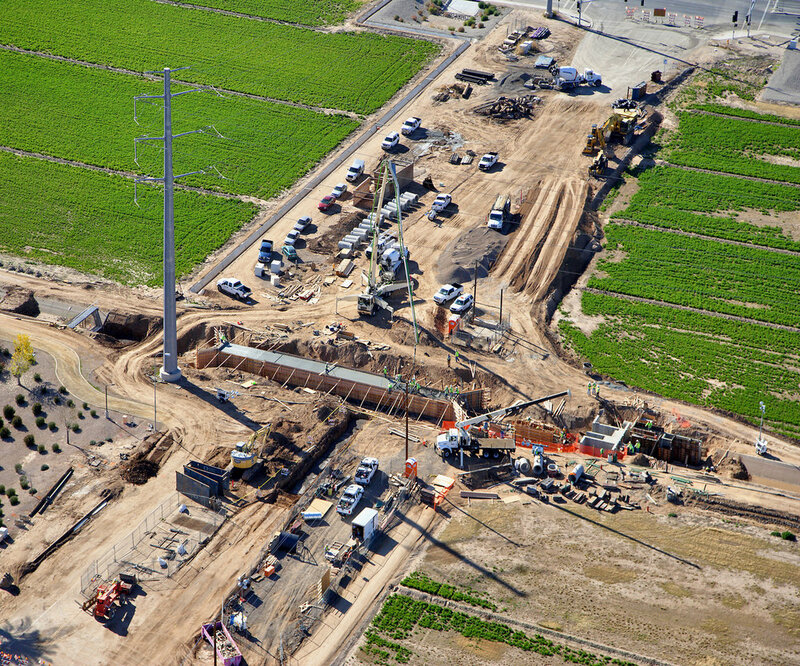 Also, the project included the installation of 3,697 LF of Roosevelt Water Conservation District (RWCD) irrigation lines, 671 LF of sanitary sewer lines, 9,576 LF of water lines, 2,349 LF of reclaimed water lines, and the undergrounding of SRP 12kV distribution lines. GMP 2 / Queen Creek Road to Ocotillo Road (Roadway Improvements): This portion of the project was completed in December 2012. Improvements were made from south of Queen Creek Road to 1,000 LF south of Ocotillo Road and on Ocotillo Road from Norman Way to Rincon (east of Gilbert Road). 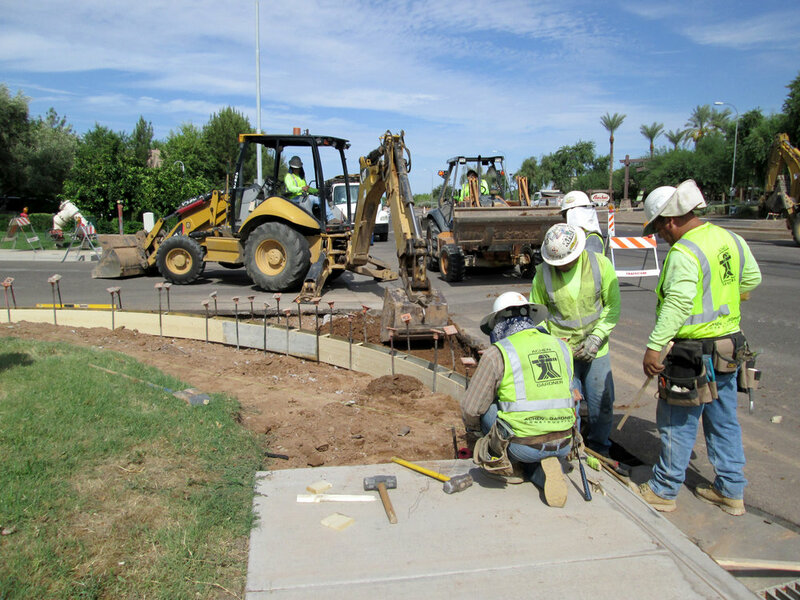 Those improvements included removals and wet utility improvements (reclaimed water, potable water, sewer adjustments, private irrigation, RWCD irrigation, and a PRV station) as well as surface items: new curb & gutter, paving, sidewalk, concrete bus bays, drainage, SRP overhead to underground conversion, street lighting, City traffic signals at the intersection of Gilbert Road and Ocotillo Road and ITS, landscaping, signing, and striping. Total quantities: 5,595 LF of water lines, 5,390 LF of reclaimed water lines, 334 LF of sanitary sewer lines, and 1,292 LF of RWCD irrigation lines. GMP 3 / Ocotillo Road to Riggs Road (Wet Utility Improvements): The scope of wet utility services included installation of jacking and boring at two RWCD piped crossings and one canal crossing, connecting to existing services, vertical realignments to avoid conflicts, installation of valves and hydrants, and relocation of hydrants. In addition to the pipe lines on Gilbert Road, the scope of work also included installation of a 10” well line on Wood Drive from Gilbert Road to the City’s well site. Total quantities: 19,768 LF of water lines, 7,560 LF of reclaimed water lines, 4,328 LF 10” DIP well water line, 2,370 LF of sanitary sewer lines, and 952 LF of RWCD irrigation lines. GMP 4 / Ocotillo Road to Wood Drive (Roadway Improvements): This phase of the project included roadway widening and new pavement expanding Gilbert Road from a single travel lane in each direction to three travel lanes in each direction, curb & gutter, sidewalk, landscaping and irrigation, undergrounding of the remaining SRP overhead distribution power and Cox communications, relocation of wet and dry utilities, ITS, traffic signals and street lighting, RWCD irrigation, roadway access and utility extensions into the new Taylor Morrison residential subdivision on Chandler Heights Road, regrading and relandscaping the two drainage basins at Brooks Ranch subdivision to meet drainage requirements, permanent and temporary retention basins, and improvements to Chandler Heights Road approximately 0.25 miles to the east and west of Gilbert Road.